The Twin Peaks are modest-size hills to the southwest of the Mars Pathfinder landing site. They were discovered on the first panoramas taken by the IMP camera on the 4th of July, 1997, and subsequently identified in Viking Orbiter images taken over 20 years ago. 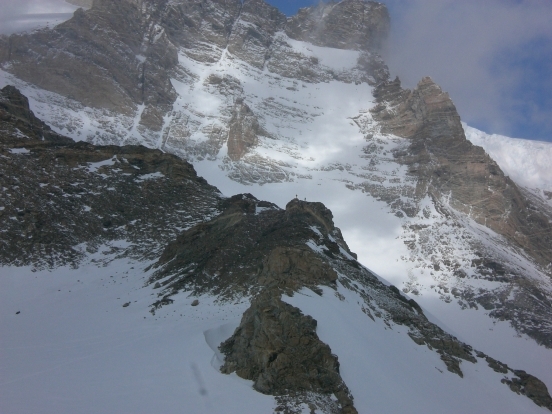 The peaks are approximately 30-35 meters (~100 feet) tall. North Twin is approximately 860 meters (2800 feet) from the lander, and South Twin is about a kilometer away (3300 feet). The scene includes bouldery ridges and swales or “hummocks” of flood debris that range from a few tens of meters away from the lander to the distance of the South Twin Peak. It’s possible to get a better appreciation of the bouldery ridges and “hummocks” of flood debris seen in the imagery by viewing color anaglyphs of the landing area and individual Mars rocks in stereo 3D using red/blue glasses. The mosaic of the landscape constructed from the first images revealed a rocky plain (about 20 percent of which was covered by rocks) that appears to have been deposited and shaped by catastrophic floods. This was what we had predicted based on remote-sensing data and the location of the landing site (19.13 degrees north, 33.22 degrees west), which is downstream from the mouth of Ares Vallis in the low area known as Chryse Planitia. In Viking orbiter images, the area appears analogous to the Channeled Scabland in eastern and central Washington state. This analogy suggests that Ares Vallis formed when roughly the same volume of water as in the Great Lakes (hundreds of cubic kilometers) was catastrophically released, carving the observed channel in a few weeks. The density of impact craters in the region indicates it formed at an intermediate time in Mars’s history, somewhere between 1.8 and 3.5 billion years ago. The Pathfinder images support this interpretation. They show semi-rounded pebbles, cobbles and boulders similar to those deposited by terrestrial catastrophic floods. Rocks in what we dubbed the Rock Garden – a collection of rocks to the southwest of the lander, with the names Shark, Half Dome, and Moe – are inclined and stacked, as if deposited by rapidly flowing water. Large rocks in the images (0.5 meters or larger) are flat-topped and often perched, also consistent with deposition by a flood. The Twin Peaks, a pair of hills on the southwestern horizon, are streamlined. Viking images suggest that the lander is on the flank of a broad, gentle ridge trending northeast from Twin Peaks; this ridge may be a debris tail deposited in the wake of the peaks. Small channels throughout the scene resemble those in the Channeled Scabland, where drainage in the last stage of the flood preferentially removed fine-grained materials. That last is an excerpt taken from Mars Pathfinder Science – Geology and Geomorphology, which explains many of the features seen in the wallpaper.